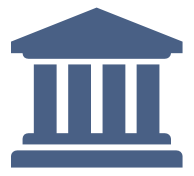 The Adaptation Capability Advancement Toolkit (Adapt-CA) is intended to assist California local governments with overcoming common institutional barriers and improving agency capabilities. By using Adapt-CA, local governments will be able to rapidly identify opportunities to improve existing capabilities in order to pursue climate change adaptation initiatives more effectively and holistically. Each component of Adapt-CA is organized by four process areas, which are defined as the core areas of control within local governments and where institutional barriers to pursuing adaptation commonly arise. Engaging agency executives and elected officials, establishing adaptation as a strategic priority, and transforming agency culture through internal coordination and staff empowerment. Allocating staff to dedicated adaptation roles, developing adaptation competency throughout the agency, and enhancing technical capabilities, tools, and resources. Standardizing authentic community engagement in agency decision-making processes, regional coordination, and external collaboration and partnerships. Mainstreaming adaptation into agency processes, implementing processes for measuring and reporting progress, and building momentum for predictable and sustainable funding. Each process area is also organized along four maturity levels, which are milestones that follow an evolutionary path toward more advanced, institutionalized, and continuously improving capabilities. Initiation: To build understanding of climate risks and adaptation to support adaptation activities on an ad-hoc or opportunistic basis. Development: To incorporate adaptation into agency goals, plans, and activities with dedicated staff leading adaptation efforts. Standardization: To establish a shared vision for adaptation with strong support from staff, leaders, partners, and community members. Optimization: To fully integrate adaptation into agency planning, investing, and decision-making processes with agency- and community-wide engagement. The Matrix describes the high-level core adaptation capabilities of a local government for each process area at each maturity level. New users are recommended to review the Matrix to gain familiarity with the Adapt-CA structure. The Checklists describe core adaptation capabilities in greater detail, as well as the associated benefits of advancing capabilities. The Checklists allow for rapid self-assessments of existing agency capabilities to help users navigate the Roadmap. The Roadmap provides suggested actions, additional guidance, and recommended resources to advance adaptation capabilities. By using the Roadmap, local government staff can pinpoint concrete next steps that will enable their agency to pursue adaptation initiatives more effectively and holistically. Adapt-CA is a product of the Overcoming Institutional Barriers to Implementing Local Adaptation Strategies project under California’s Fourth Climate Change Assessment. 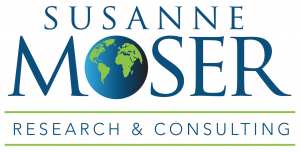 The toolkit has been developed by the Local Government Commission, ICF International, and Susanne Moser Research & Consulting in partnership with ARCCA. Communities throughout California are already experiencing the devastating impacts of climate change – from more frequent and intense wildfires and extreme weather events to prolonged drought and extreme heat. While many local governments have taken action to address current and future impacts, many continue to face institutional barriers that hinder their transition from adaptation awareness to planning and implementation. Each agency is uniquely situated with varying levels of leadership support, staff capacity, community engagement, and access to resources, each of which can serve as a barrier or driver to adaptation action. While California as a whole has made considerable advancements, progress remains uneven throughout the state and many local governments report that institutional barriers hinder progress on adaptation. As such, Adapt-CA has been developed to assist local governments to overcome these barriers by identifying actions that can be taken to advance agency capabilities. Adapt-CA is intended to be used by local government staff who are involved in day-to-day management and operations, as well as by agency executives. The toolkit allows for both a top-down approach among decision-makers and a bottom-up approach for project managers and planners. Due to the inherent nature and scale of climate change impacts, it is recommended that key departments and offices, including community development, economic development, emergency services, sustainability and public works, collaborate to fully leverage this toolkit. The development of Adapt-CA has been informed by Capability Maturity Models, which originate from the software development industry to describe current processes and strategies to overcome barriers to improve processes and produce desired outcomes. This toolkit provides guidance on improving agency capabilities without specific connections to regulations or funding opportunities. While it can be used to identify areas that require further attention and investments, as well as to build the case for making such investments, the sole use of this toolkit is not expected to provide additional funding for adaptation and resiliency efforts. 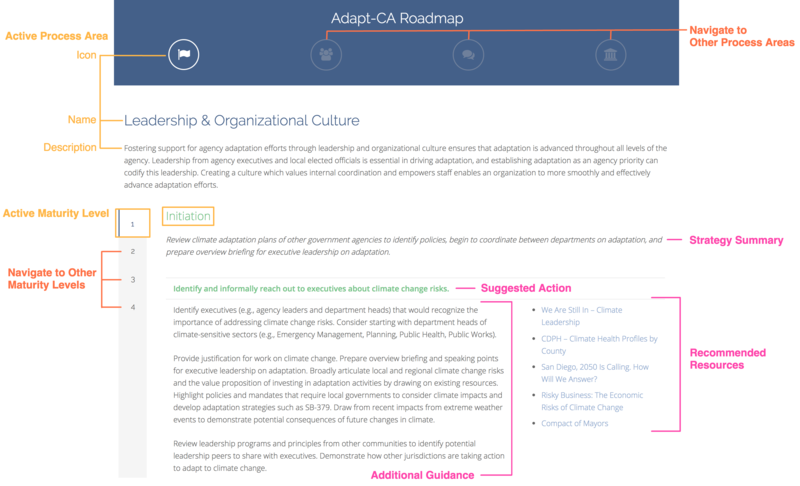 Although Adapt-CA is designed with the understanding that each agency encounters unique challenges and opportunities in order to enable local governments of all sizes and types to utilize the toolkit, reaching the highest maturity level defined in this toolkit may not be desirable or suitable for all California local governments. The Matrix describes the high-level core adaptation capabilities of a local government for each process area at each maturity level. New users are recommended to review the Matrix to gain familiarity with the Adapt-CA structure and to gain an understanding of what each process area includes. The Matrix serves as the backbone of the toolkit and follows the structure of Capability Maturity Models, which were pioneered by the software development industry. Limited consideration of climate risks and adaptation in agency activities, driven by individual champions, with minimal support from executive leadership or local elected officials. High-level incorporation of climate risks and adaptation in several agency goals, plans, and programs with engagement from some agency and elected leaders. Agency conducts occasional coordination meetings among key departments. Strong integration of climate risks and adaptation into all agency goals, plans, and programs with regular interagency coordination and widespread recognition across leadership and staff of the importance of adaptation to achieve agency and community goals. Climate risks and adaptation are central to overall agency goals and activities as core guidance for decision-making, planning, and investment. Agency leaders and local elected officials are at the forefront of driving adaptation action and building a culture of resilience. Limited allocation of time and resources to pursue adaptation on a project-by-project basis. Staff begin to increase understanding of climate risks by reviewing introductory resources. 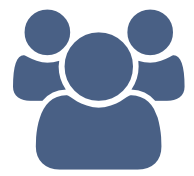 Point-person responsible for adaptation activities and additional champions in other departments identified. Staff have access to broad resources to build technical skills and understanding of local and regional climate risks and adaptation opportunities. Role of adaptation point-person is formalized with champions from all key agency departments. Staff have consistent and reliable access to resources, tools, and trainings to build their expertise on adaptation strategies and measures. Agency-wide competency on climate change risks and adaptation, including all senior-level staff, with dedicated adaptation staff appropriate to agency size. Staff have access to all key tools and resources to conduct adaptation planning and implementation activities. Ad-hoc and limited external communications about climate risks and adaptation to community members, and limited collaboration with external stakeholders on a project-to-project basis. High-level integration of climate risks and adaptation into general external communications beyond just projects. Some community input factored into adaptation considerations, and some mapping of external skills and resources conducted. Consistent and timely engagement with relevant community audiences based on an adaptation- specific engagement plan. A strong network of external collaborators is regularly accessed and utilized for adaptation efforts. Robust community engagement and stakeholder feedback loops are prioritized and formalized throughout local government operations, so as to ensure adaptation activities reflect and respond to community needs, and strong processes for utilization of external collaborators are well defined and regularly adapted based on changing needs. Ad-hoc adaptation activities occurring on a project-by-project basis with varied levels of comprehensiveness and ad-hoc or opportunistic funding for adaptation. High-level integration of climate risks and adaptation into several projects, activities, and agency processes with basic understanding of the business case for undertaking adaptation in projects informing decision-making. Strong integration of climate risks and adaptation into standard agency processes across many departments, with some dedicated funding for adaptation and some efforts to quantify investments and to monitor performance. Fully institutionalized integration of climate risks and adaptation into agency decision making. Planning processes and financial considerations with formalized review and updated processes to manage changing risk conditions, defined and adopted systems for tracking project and program outcomes against agency-wide measures of adaptive capacity, and clearly defined climate risk standards for agency budgeting. The Checklists describe core adaptation capabilities in greater detail, as well as the associated benefits of advancing capabilities. By using the Checklists, local government staff can conduct rapid self-assessments of existing agency capabilities in order to navigate the Roadmap. These can also serve as resources to demonstrate to other staff and decision-makers the importance of developing adaptation capabilities. The Roadmap is the culmination of the research project and the most robust and detailed component of the toolkit. The Roadmap provides suggested actions, additional guidance, and recommended resources to help local agencies advance their adaptation capabilities. By using the Roadmap, local government staff can pinpoint concrete next steps that will enable their agency to pursue adaptation initiatives more effectively and holistically. We are working diligently to keep the Roadmap as up-to-date as possible, which can be challenging due to the rapid evolution of the adaptation field in California. If you have any recommendations for additional resources to include or to improve the suggested actions or guidance provided, please contact us. Do you have any suggestions for improving the suggested actions or additional guidance provided? Do you have any resources that you recommend including? If so, please provide links or send attachments to jkim@lgc.org. Do you have any additional comments to share at this time?